The homeowners had owned this 2,800sf apartment for many years but had never undertaken renovations as they lived in Washington D.C. 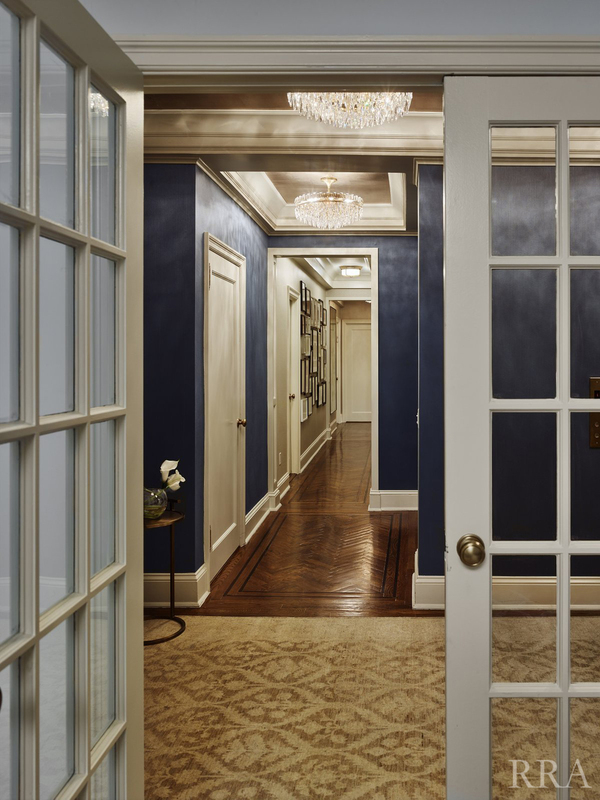 The goal was to renovate this Classic 8 landmark apartment while preserving its pre-war character. With south and east exposures at 10 windows the apartment was light-filled and afforded significant views of Central Park and the city. The result is an urban oasis in the aerie-like light-filled apartment that seamlessly integrates traditional methods, modern materials, lighting and technology. Decorative plasterwork and wood trim were painstakingly restored and new windows, new wood floors, and new built-in casework were installed with motorized window shades, all new electrical and AV/IT wiring, new lighting and air-conditioning to create a comfortable, amenity-filled home controlled via i-pad interface. The renovated kitchen with new window-side banquette and eating area replaced a fire-ravaged kitchen which previously had it’s only window crowded by required vents and a window air conditioner. 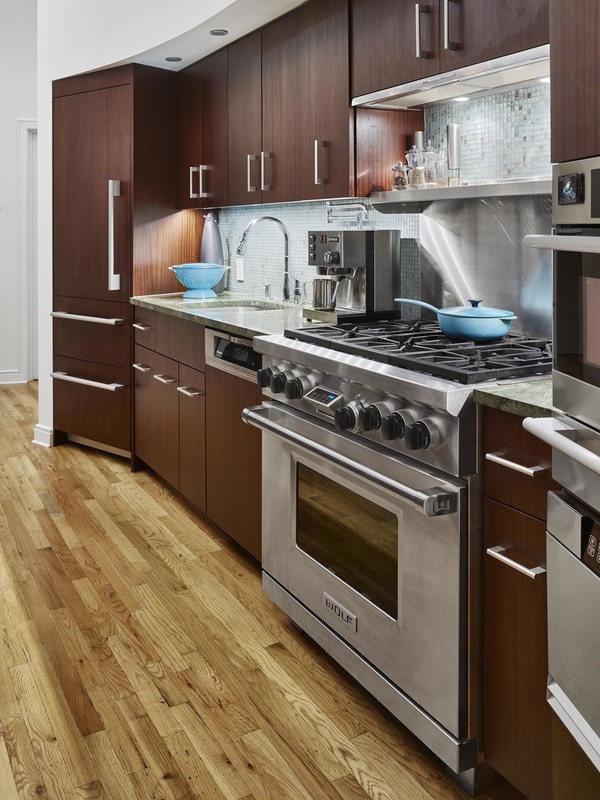 The homeowner desired a more functional kitchen with increased space for storage, new lighting and appliances. Our design goal was to transform a dark and out-of-date kitchen into a beautiful, streamlined, efficient space that increased storage and counter space. Reconfiguring the hallway and a large portion of the master closet, we expanded the kitchen across the hall, creating a niche for the refrigerator and wine storage. Separating the tall elements from the original galley, the new design was able to provide uninterrupted counterspace and extra storage. 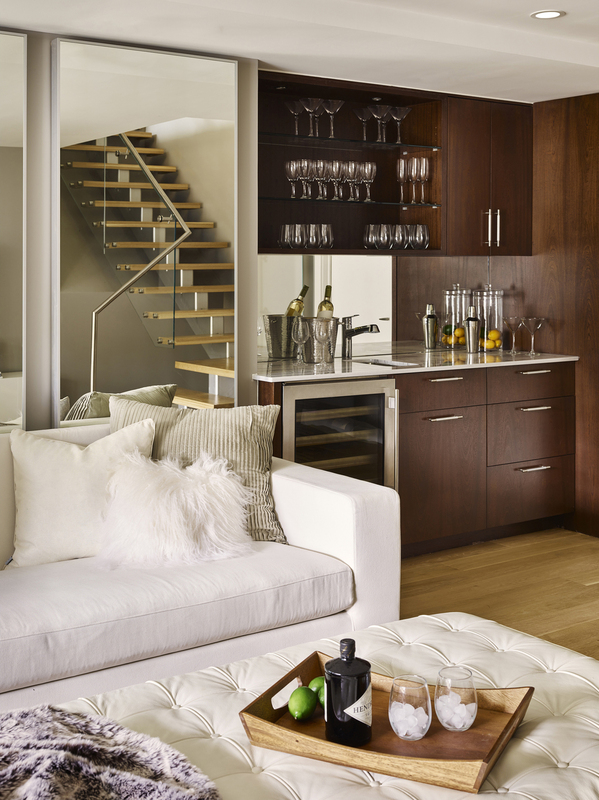 Because of its proximity to the living area, the niche is also able to serve a dual role as an easily accessible bar with glass storage above when the client is entertaining. 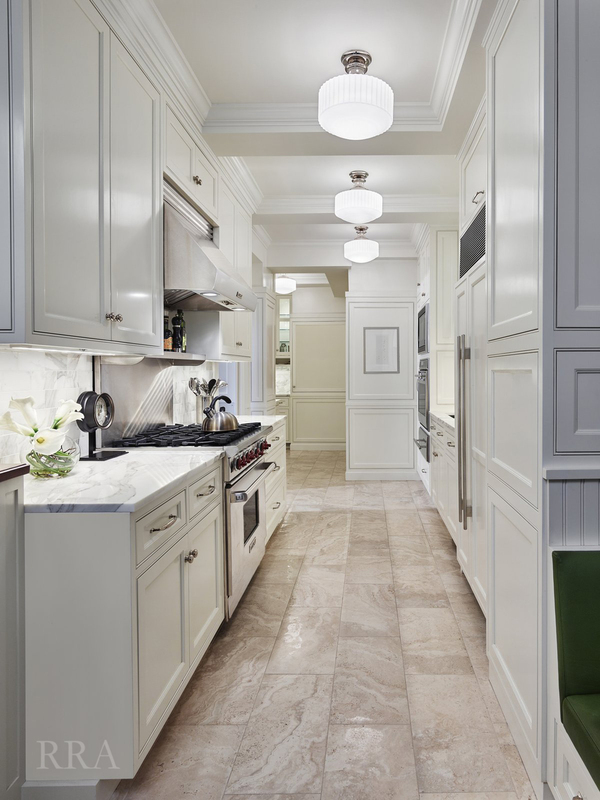 Modern, high-gloss cabinetry was extended to the ceiling, replacing the existing traditional millwork and capitalizing on previously unused space. An existing breakfast nook with a view of the East River, which had been one of the client’s favorite features, was awkwardly placed and provided for tight and uncomfortable seating. RRA rebuilt the banquettes, pushing them back for easier access and incorporating hidden storage compartments into the seats. Originally built as two adjacent townhouses at the turn of the century, the buildings were combined in the 1980’s and converted into an upscale apartment building. The existing duplex was minimally joined through a bottleneck passage and offered little flow between the two sides. RRA opened up the 18” masonry demising wall that split the unit in half. With additional structure, two eight foot long openings were cut into the load bearing walls and now connect the living and dining spaces. The expanded living space also has a visual connection to the floating stair to the adjacent level. The renovation of all interior spaces and the split-level terrace provides better flow and expansive views both within and to the East River beyond. this 1,700 SF loft is home to a family of four. RRA Acommodated an extensive collection of books and wine by creating a book mezzanine with a wine cellar below for added space. An elliptical cove complete with multi-colored LED's adds an element of space using 2 large restored columns as points of reference. 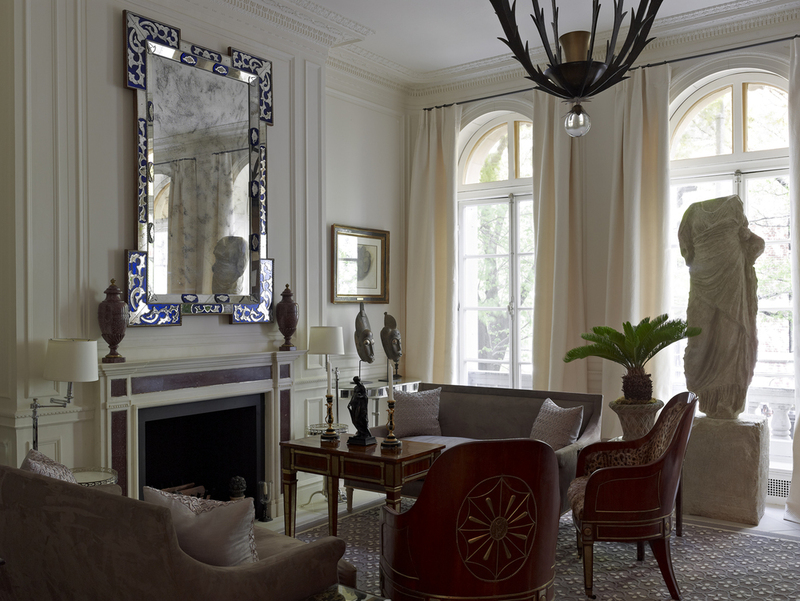 The main objective was to create a warm, inviting home with a dramatic flair that incorporates the geometries of space. Emery Roth Building. This 4,200SF 6 Bedroom, 6 Bath apartment received updates to the layout as well as all new kitchen and updated bathrooms with classic details throughout the apartment that remain true to the pre-war genre. wanted to create a modern Pied a Terre, allowing their large extended family to congregate in the city. 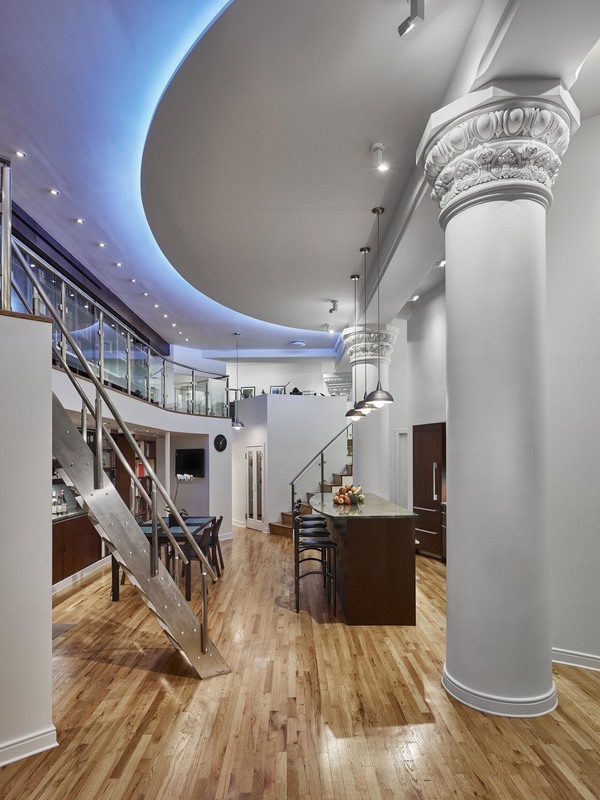 While the front of the structure was restored to its original configuration, and a missing stoop recreated, the new rear extension and expanded penthouse have a more contemporary aesthetic. 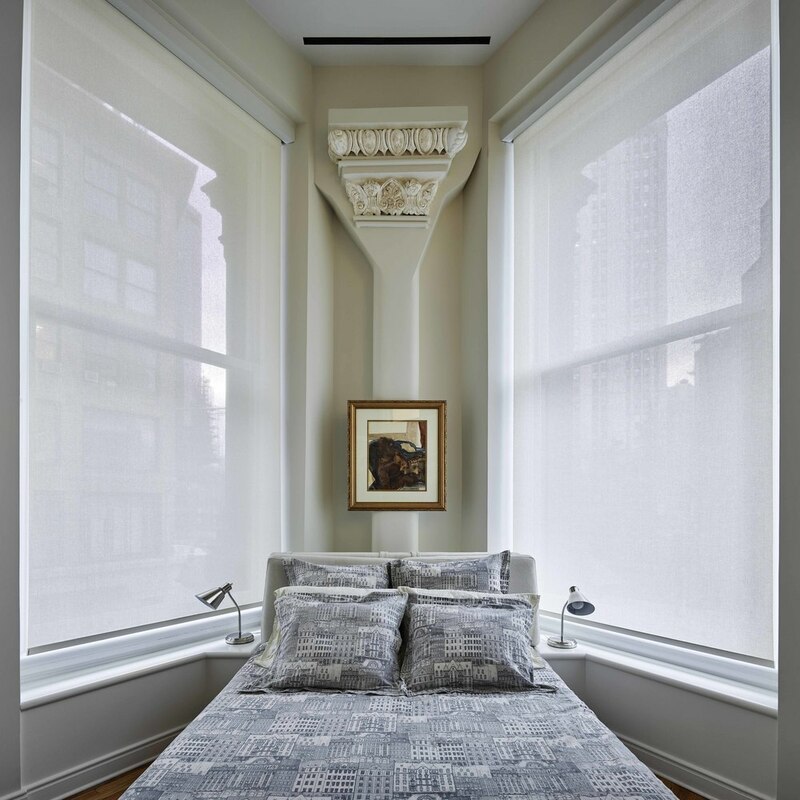 Floor-to-ceiling, wall-to-wall, turn-of-the-century factory-style windows on all floors of the north façade allow light into the building to create a modern, open feel. The floor plate was enlarged by removing the existing L-shaped rear extension and extending the entire rear elevation. 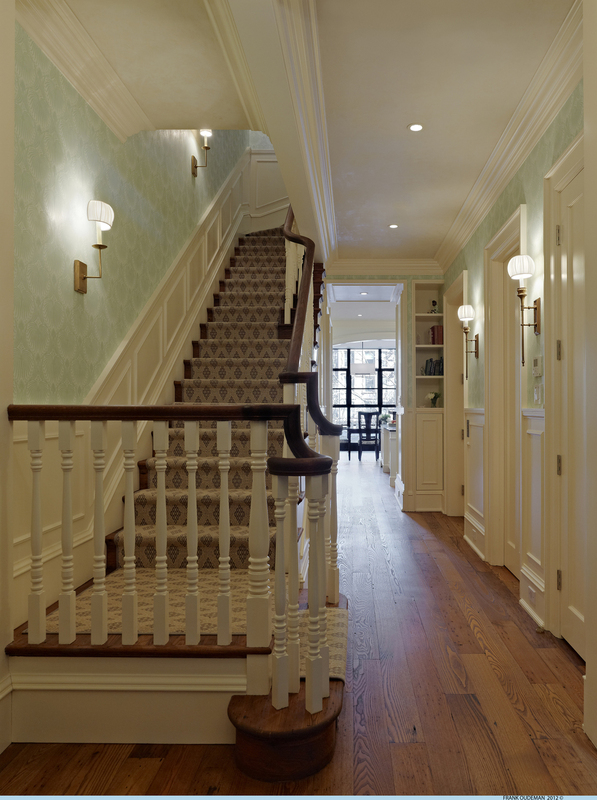 In addition, the center of the existing interior was reframed to accommodate a new elevator and refurbished stairwell. 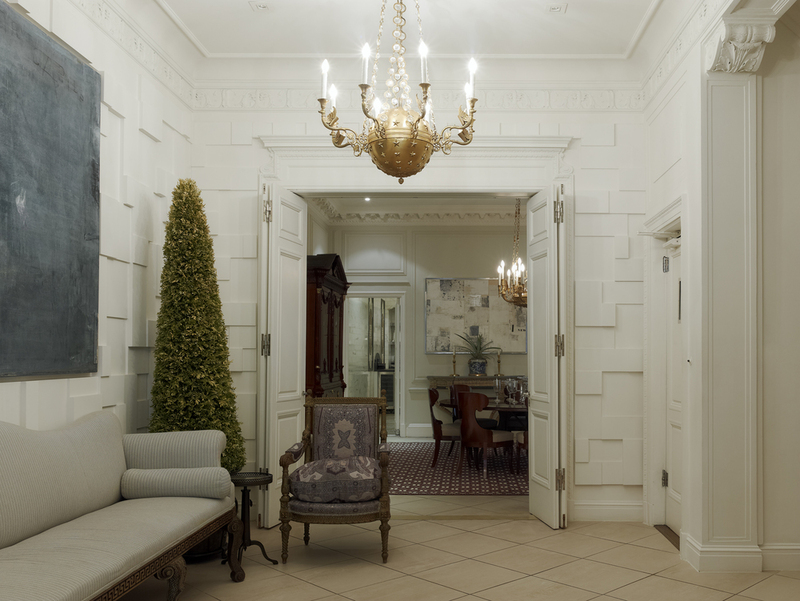 The interior design of the building reflects the client’s eclectic style, combining many traditional design elements with modern and environmentally conscious materials. 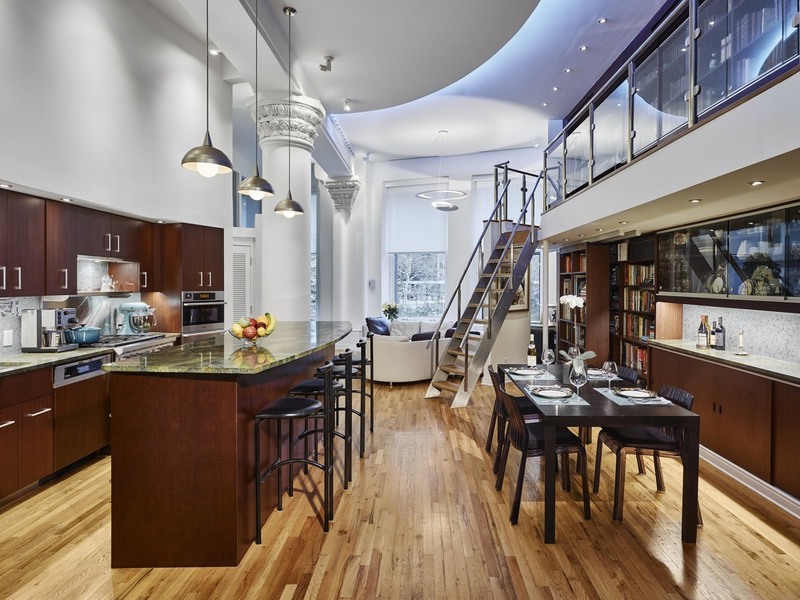 this 6 story 10,000 sf townhouse sits on one of Manhattan’s most beautiful Upper East Side streets. Because each room was designed like a TV studio set, much of the interior was superficial in the sense that plumbing fixtures were not all connected, existing walls were “false walls” built in front of actual partitions and much of the construction hat to be rebuilt. Scope including a new gourmet kitchen on the ground floor, new detailing on living room and dining room level, new master suite closet and reconfigured hall, new 4th floor bath and top floor playroom. The main objective was to create a functional yet elegant and cohesive single family living space. 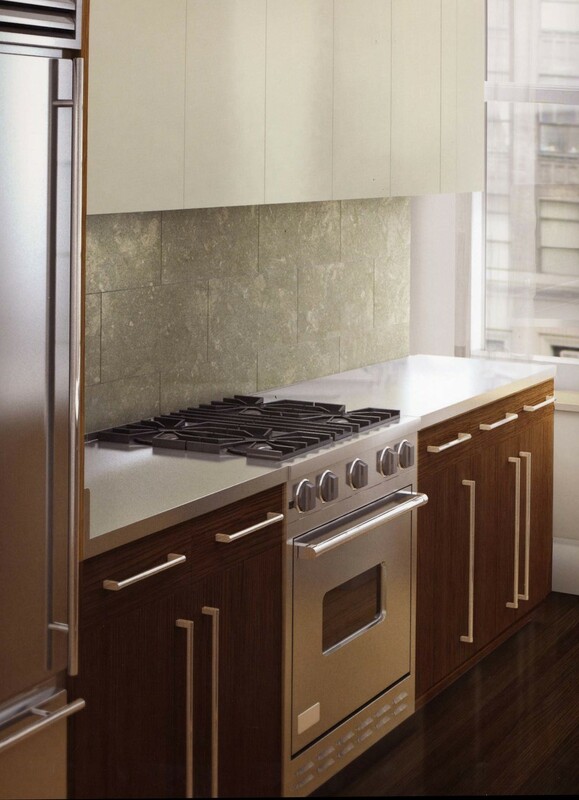 while maintaining the classic seven layout of this pre-war Upper West Side apartment. 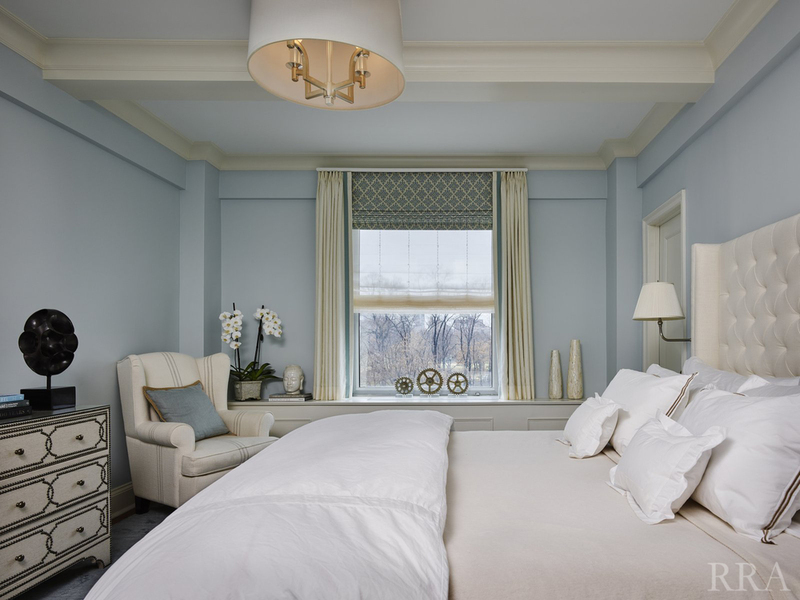 The renovation included a large master bedroom (combining two bedrooms), new fixtures and finishes in all three bathrooms and enlarged kitchen. 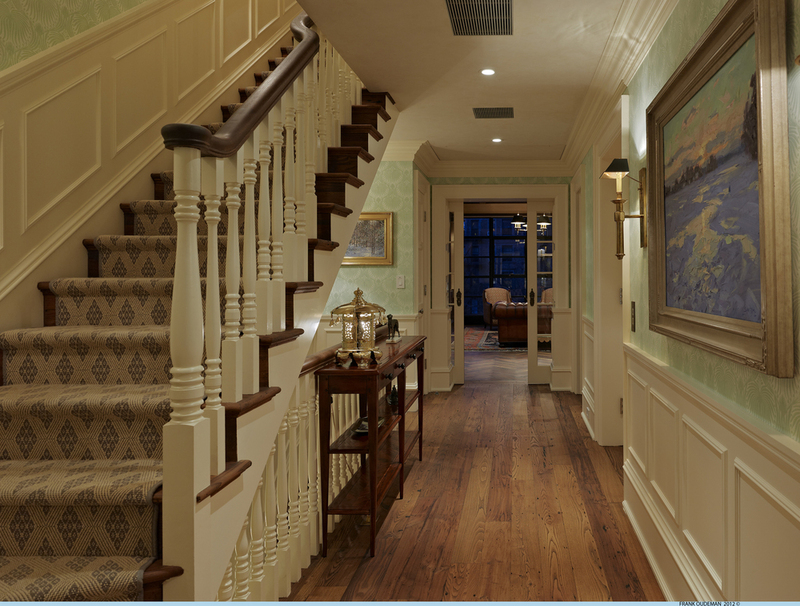 All moldings and column capitals including the dining area wall paneling were stripped and the oak & plaster detailing was restored. 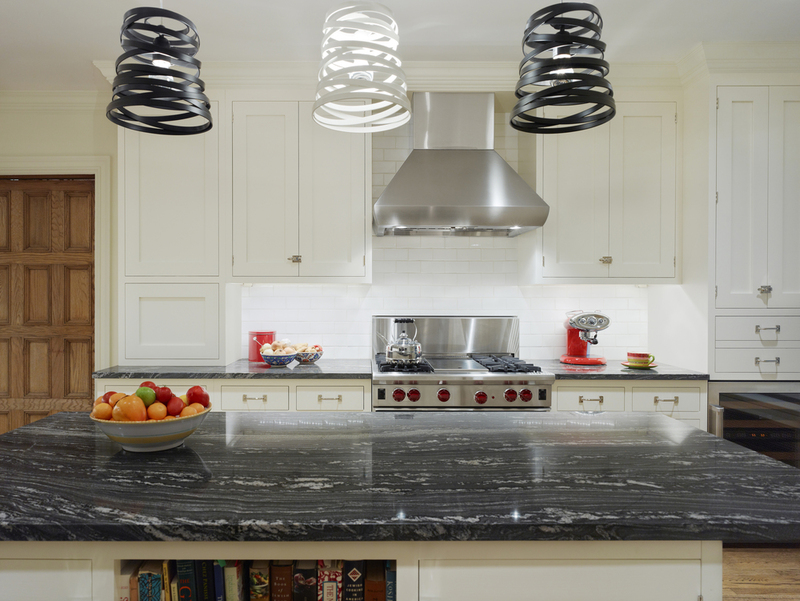 The kitchen was reconfigured which allowed for a fully functioning space and open eating area with a 3’ by 7’ marble slab island. 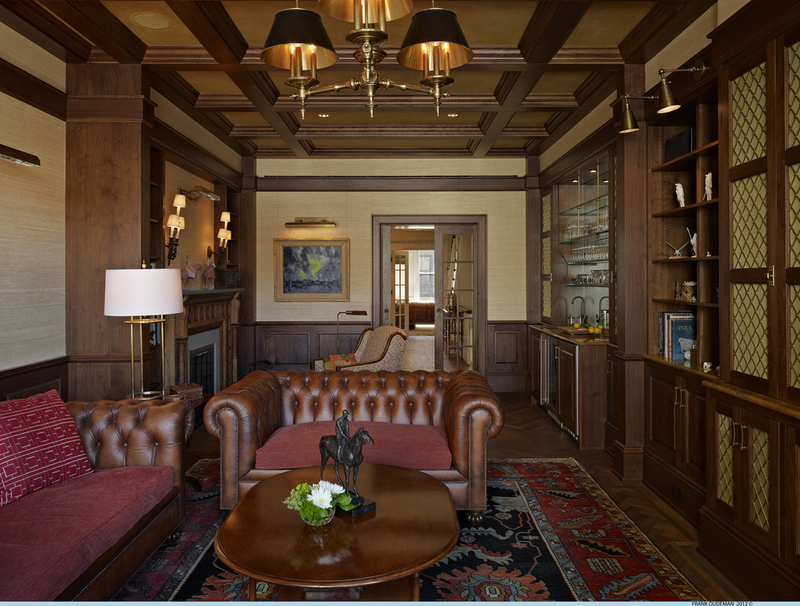 The new layout provides the formal yet casual feeling the client desired while maintaining an elegance worthy of its grand south views of the neo-romanesque building of the Natural History Museum. multimillion-dollar condominiums for sale. The building, situated on a 10,092 sq. ft. site along museum mile, consists of two cellar levels which contain electrical and mechanical equipment, storage, laundry and new recreational facilities, a ground floor level which will be used primarily for lobby, medical offices and a superintendent’s apartment plus seventeen floors for residential use all which required major interior reorganization. The site work includes widening gardens along Fifth Avenue, creating gardens along 101st Street building facade, providing ramp access into the building, creating office access at the front and a new marquee at the entry.The client wanted to retain the pre-war feel of the building mixed with modern high-end finished interiors in the kitchens to increase the marketability of these units. 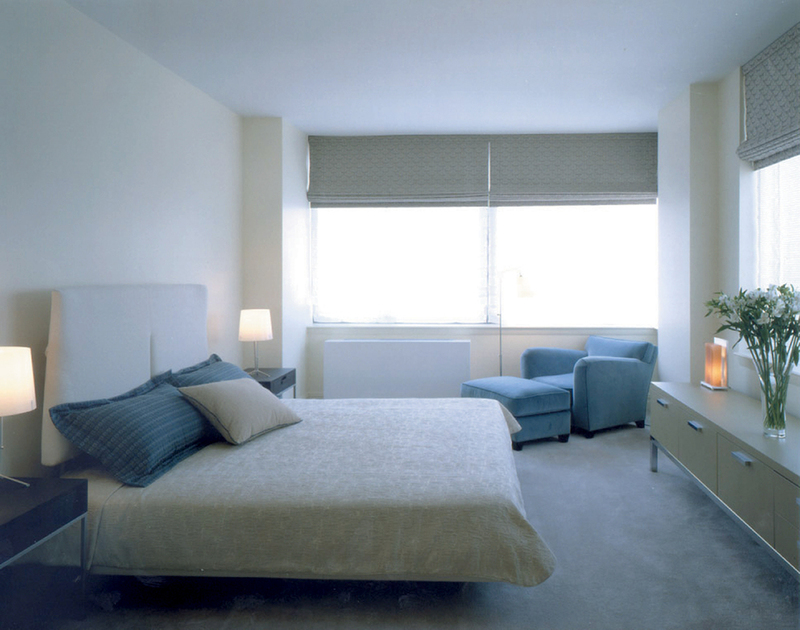 The penthouses, which have access to private roof terraces, required a partial redesign to bring it up to par with the rest of the complex.In addition, the firm assisted with the selection of furniture and finishes for the model apartment in which the client will have Corcoran Realty showcase the condominiums. Rental Building on the Upper East Side of Manhattan. The building’s main features include 2 exterior spaces on the ground floor which were under-utilized. A long entry corridor to the center lobby space. This did not meet the needs of disabled tenants. 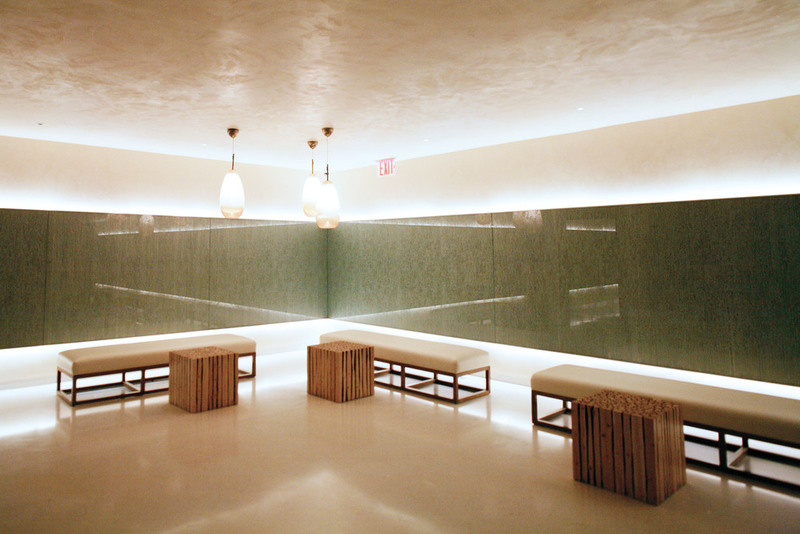 The client sought to resolve these issues, and create a unified, modern aesthetic. 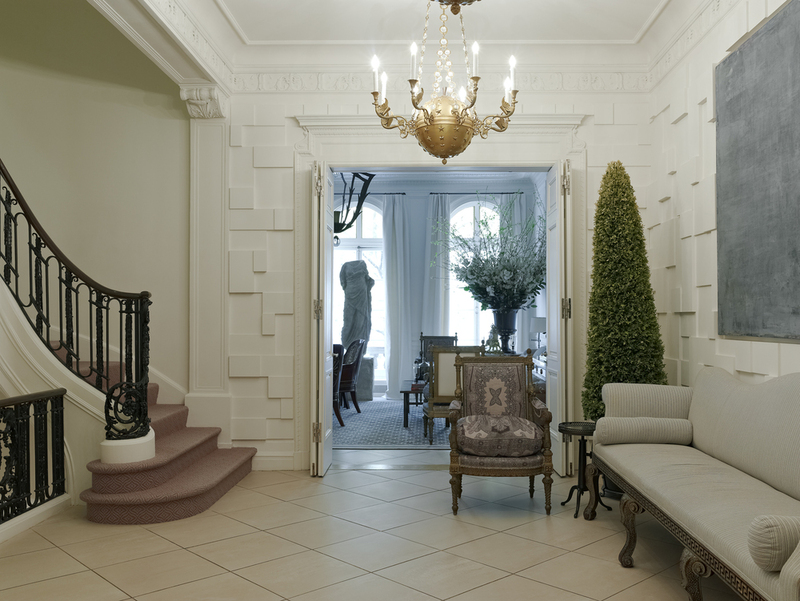 A prominent entry alongside a new sculpture garden, leading to an elegant and inviting reception area. 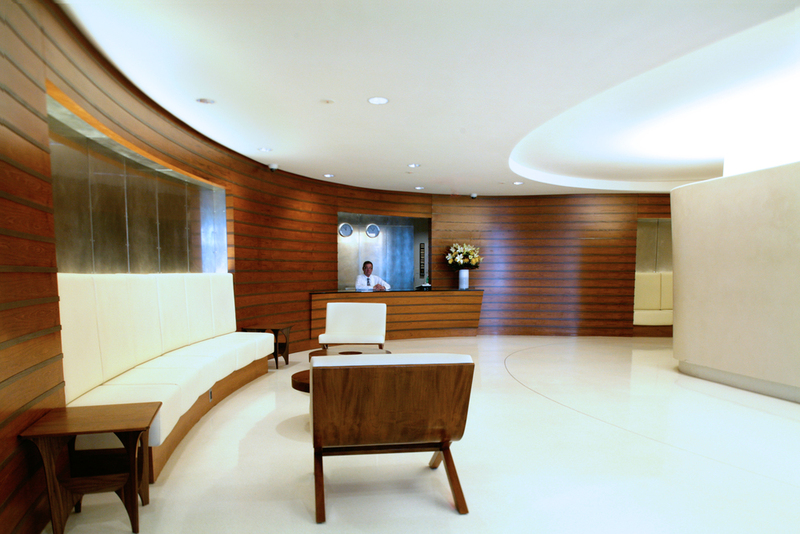 The building’s 20 residential floors were also updated to unify & complement the lobby design. Building on the Upper East Side. One of the main features of the building is the retail plaza on the 3rd Avenue façade, which was reconfigured and opened up by removing four vent towers from the garage below. 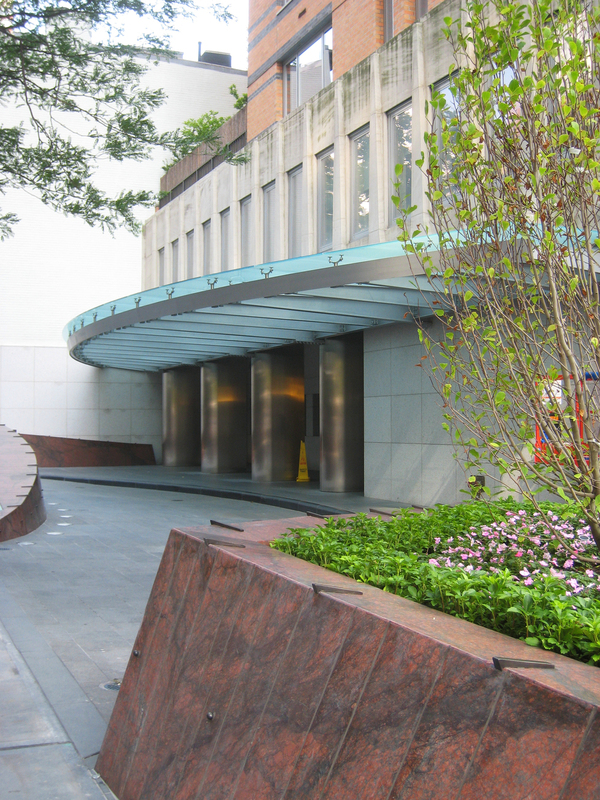 The ductwork was relocated from below and the grille moved to the far façade making the plaza better utilized. 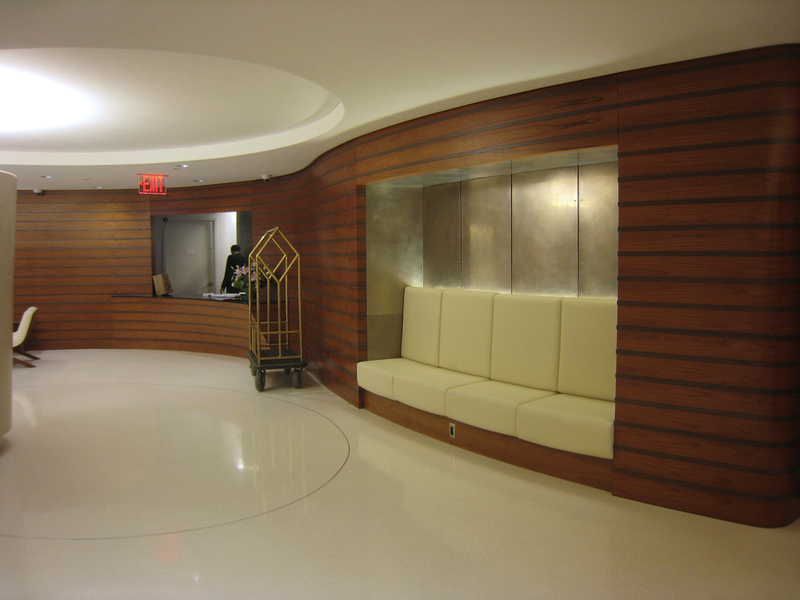 In the lobby a nautical theme of teak slat walls, forms a bench and the concierge desk. A new glass and stainless steel canopy at the residential entry and over the retail stonefronts streamlined the facades. New custom stainless steel and back-lit glass further update the building’s exterior. New stone cladding and frameless stonefronts continue the modernization, accentuating the cast concrete ornamentation on the building’s facades. A new paving pattern and custom stone planters carry the nautical theme throughout the building property. 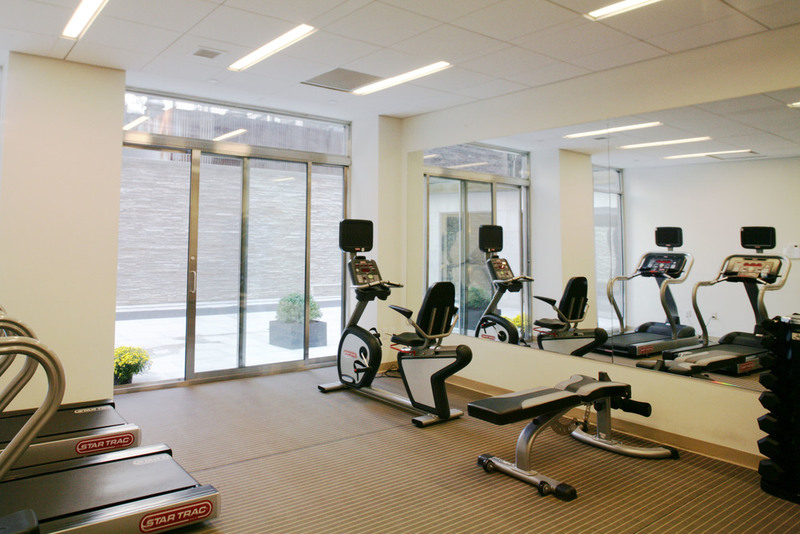 The basement was reconfigured to create a residence center with gym, kids’ play area, meeting rooms, restrooms and pantry. 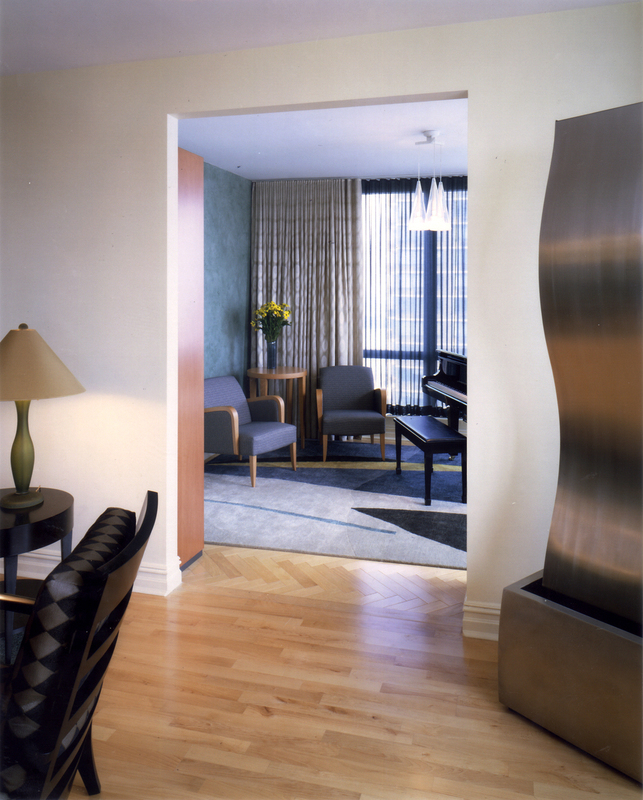 The 28 residential floor corridors were also renovated with new teak veneer doors and metal frames, new stainless steel elevator doors, with teak and nickel insert paneling, new carpet and lighting throughout. pre-war building that is being converted into condominiums at 260 Park Avenue South. The first penthouse covers 8,000 square feet including a 4,000 square foot terrace. The second Penthouse is a duplex of similar size plus pool deck and terrace. RRA made changes to the building envelope, fire stair and penthouse terraces.The design included raising a 48 foot long stainless steel swimming pool and 64 square foot Jacuzzi by crane 14 floors and installing them on the terrace of the second penthouse. RRA took the lead responsibility of coordinating the interior designers’ ideas, preparing design development drawings and construction documents for filing as well as assisting with bidding and all construction administration. 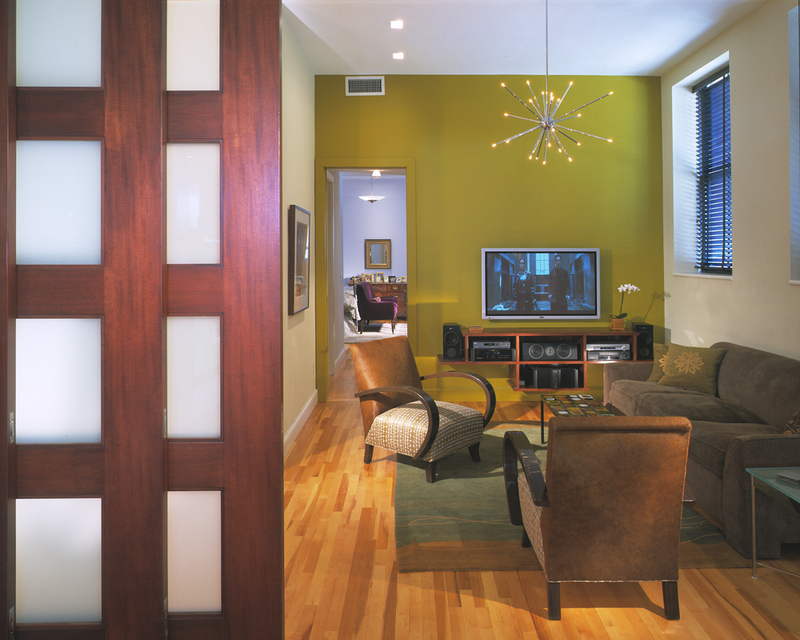 downtown apartment was limited by structural walls and existing risers. 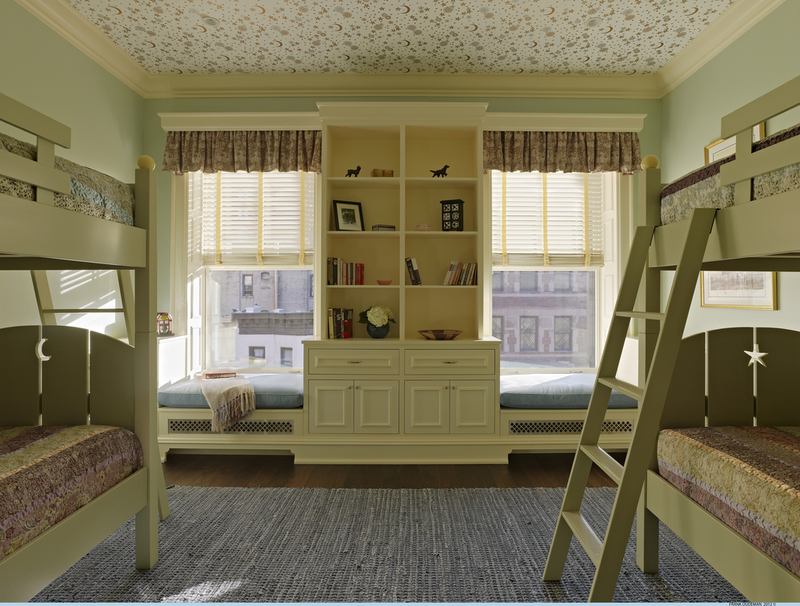 A nursery was designed as an alcove space adjacent to the en-suite master bedroom. The kitchen and living areas were opened up to expand the space and maximize the light and views from the eastern glass wall. The new space is ideal for the family’s hectic lifestyle. 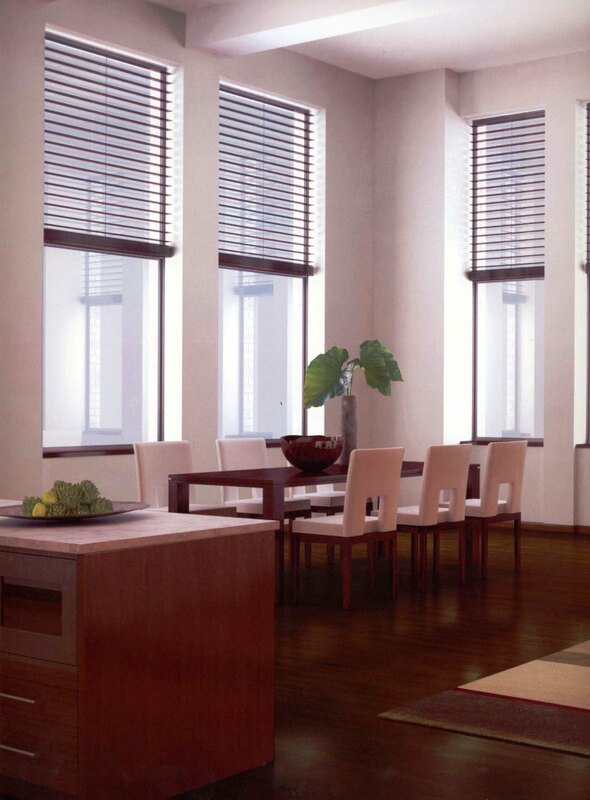 into a sleek, contemporary living space, though several obstacles had to be overcom. The tight budget of $75,000 and short six-week construction schedule left little room for error. 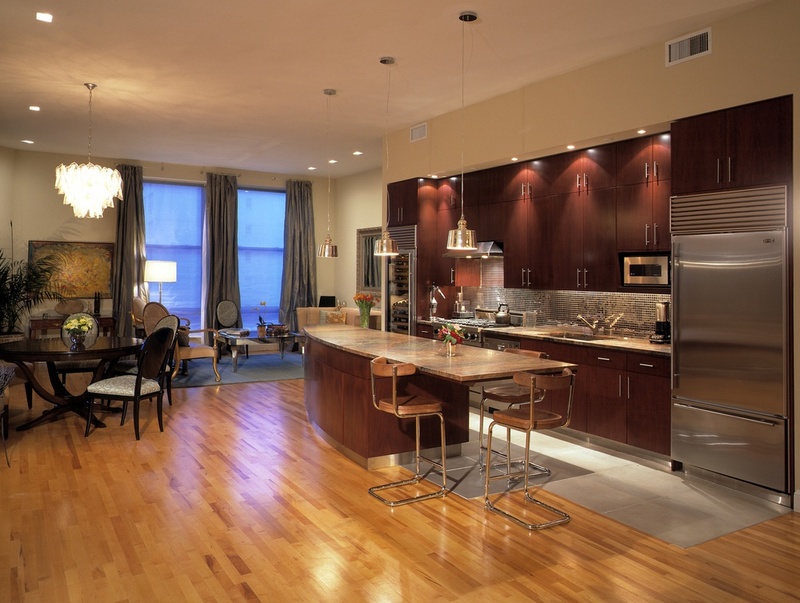 Dining, relaxing, and entertaining are the highlights of this apartment. 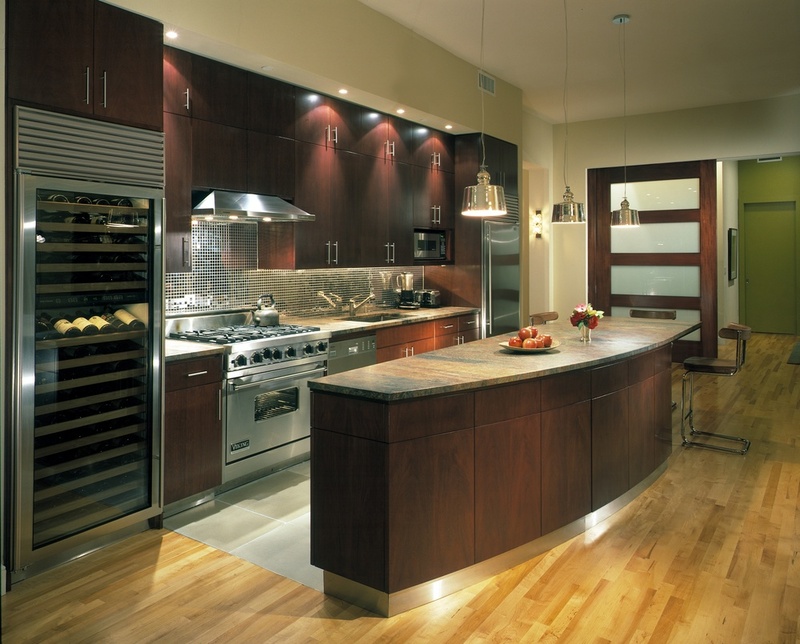 The kitchen, was designed to be efficient, well-organized, and functional as well as being the center of activity. The entry, living room, and kitchen areas were opened up by removing several walls and unifying the spaces. The use of stainless steel appliances, cool grey Pietra Cardosa limestone and satin metal laminate cabinets, designed in pure geometric forms emphasize the update of the kitchen.A 13’-0” cantilevered counter separates the kitchen from the living area and helps define the overall function of the spaces, while allowing light to flow unobstructed through the space. The concealed structure of the island was designed to create the illusion that the counter is “floating” off of the existing concrete columns. The client’s home has become a magnet for visiting family and friends. 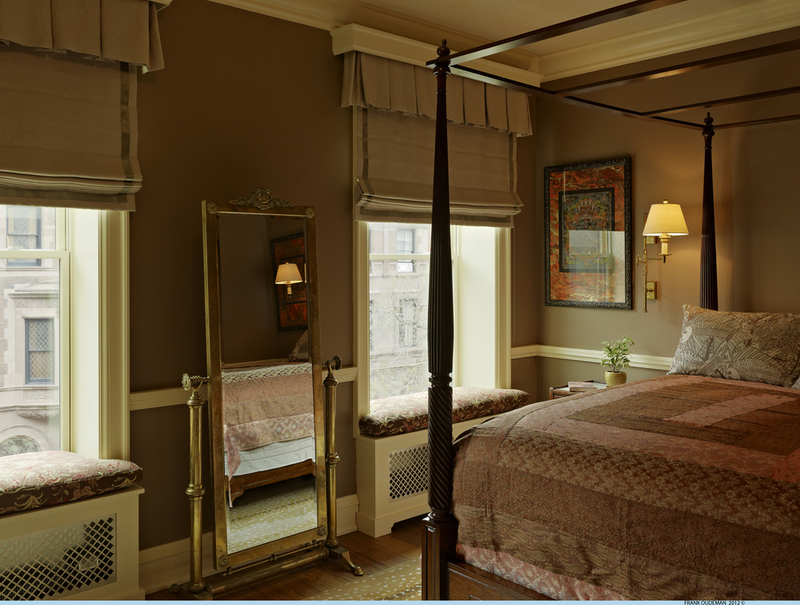 She preferred her bed to remain in the corner of the living area in order to reserve the bedroom for her guests. The bedroom and bath was reconfigured in order to provide for a bathroom en suite. 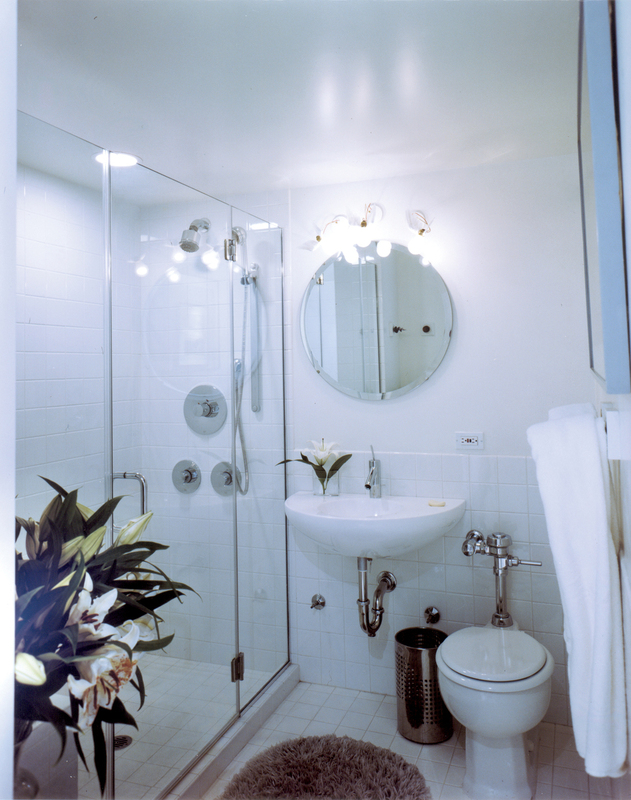 In the process of redesigning the guest area, the bathroom was enlarged and made more functional and the long corridor reconfigured to be used as a gallery space to display the client’s extensive collection of original artwork and photographs.The powder room was designed using Philippe Starck fixtures, continuing the overall simple, modern aesthetic. 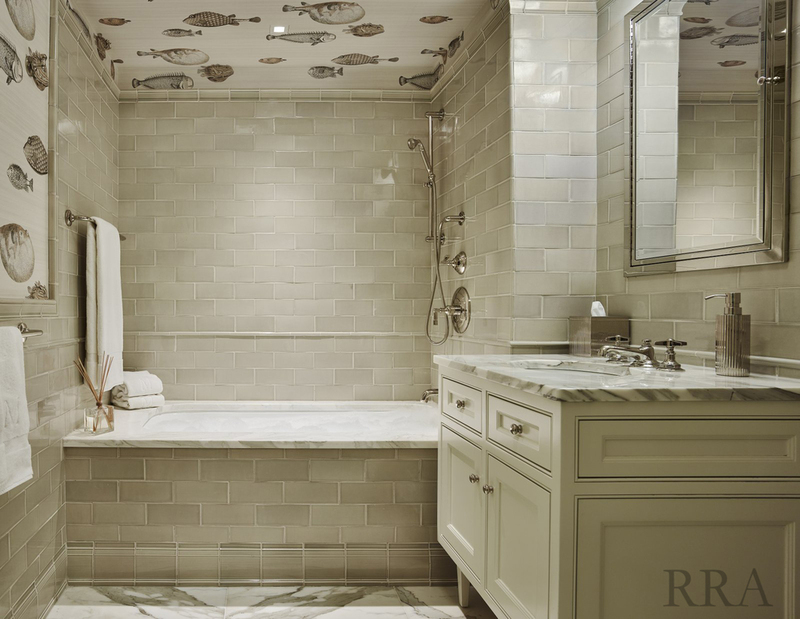 Both the powder room and bathroom were done completely in white, using whimsical accents in color to make the space more vibrant, such as colored acrylic bottle stops which were mounted to the walls for use as robe hooks. 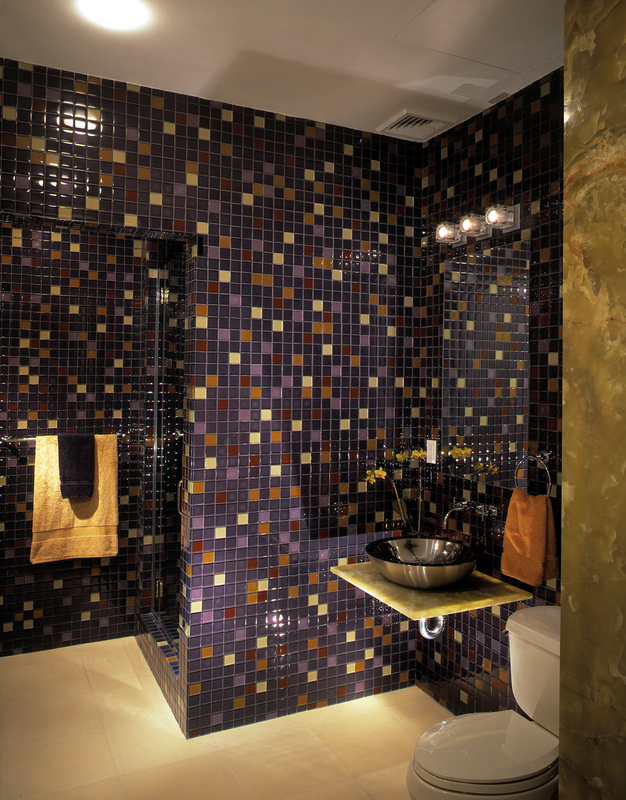 Gaudi door handles, Imagine Tile photo-realistic tiles of river stones and Ingo Maurer Lucellino “flying lightbulb” fixtures were also used in the bathroom to add to the fun, inviting theme that permeates the apartment. also required enlarging the master bath. The new guest bath was created in an alcove with a concealed sticking panel with access to the master bath. 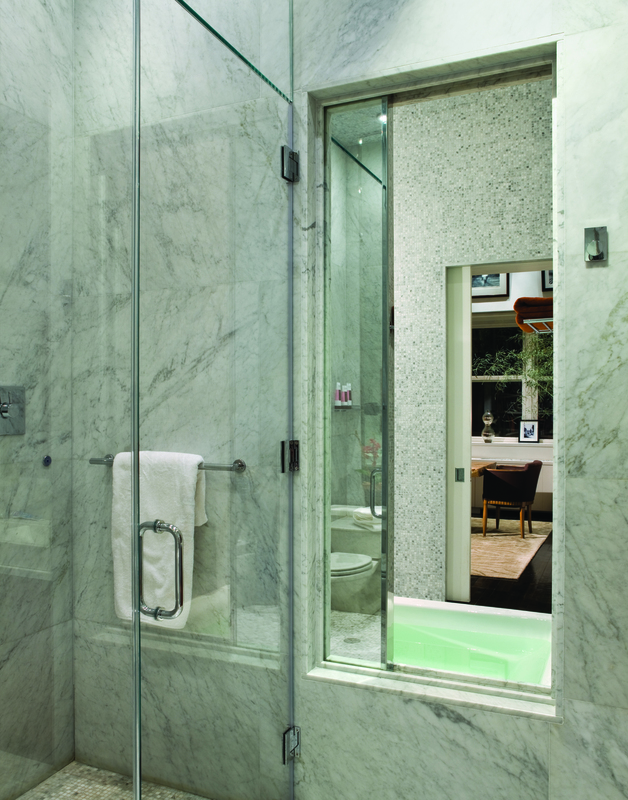 The opening allows natural light into both baths and the ability to access the bathtub from either room. 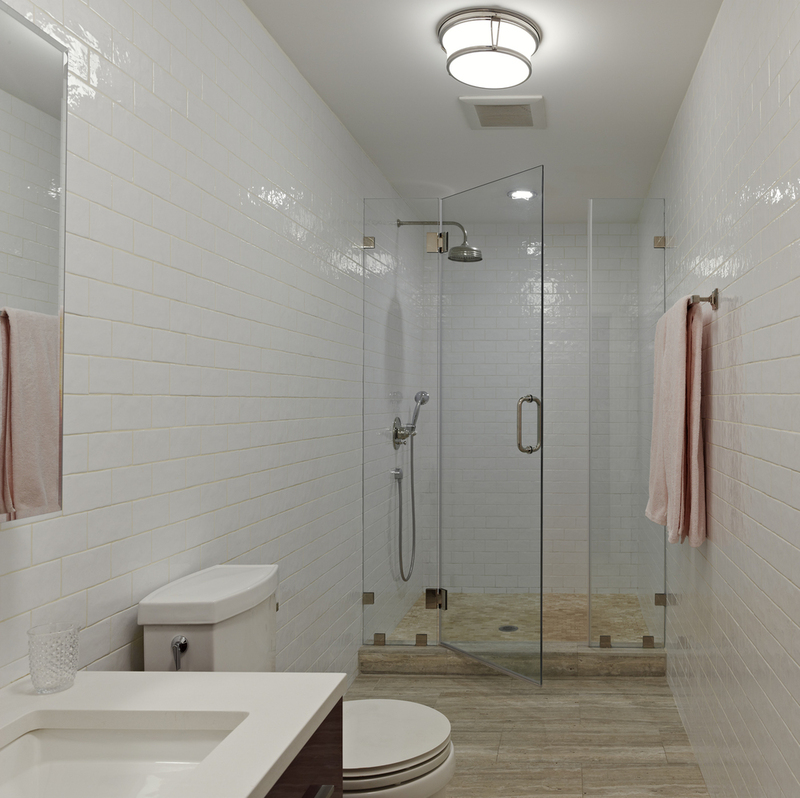 All features including a new 3’-6”x8’-6” walk-in-steam-shower are ADA compliant. The second floor terrace was also renovated into a lush tranquil retreat with IPE decking, teak planters and trellis. was completely renovated with new furniture, lighting and window treatments, so a young actor could live and work at home. The former dining room was changed to a music room with a grand piano. The living room was converted to a dance studio with a maple spring leaded dance floor and an enormous mirror so that he could practice tap dancing. 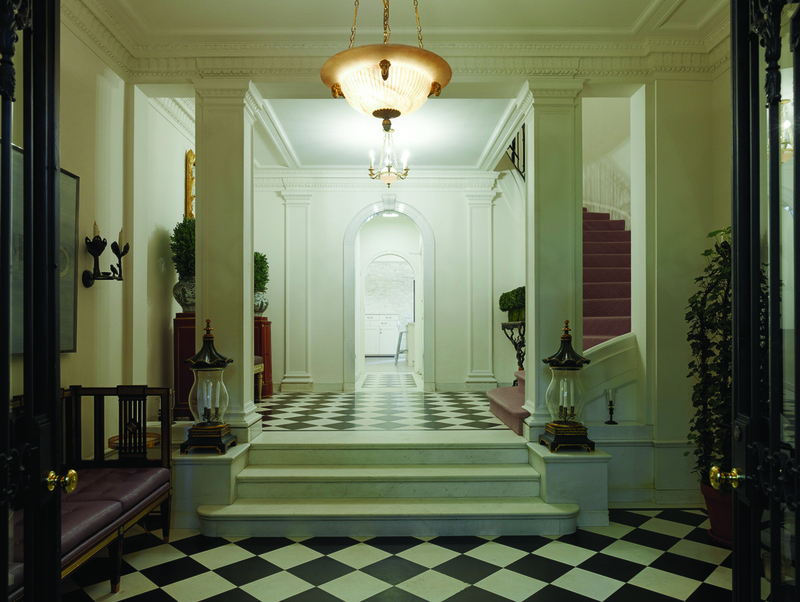 The entry foyer was reconfigured and enlarged to double as the dining room. An office space was incorporated into the closet of the third bedroom. was updated and made accessible for the client’s changing medical needs. The core of the apartment was reconfigured using glass walls in four locations. The master bath has a sliding translucent glass and stainless steel panel that creates a powder room within the bathroom. The kitchen employs a 3 panel sliding glass wall to open and close the dining room from the kitchen and a sailing image was enlarged and sandwiched between to create a twelve foot long wall that dramatically divides the entry and sitting room. An all-glass display case for the ship models separates the sitting room and living room and at the same time does not obstruct the impressive views of the East River. 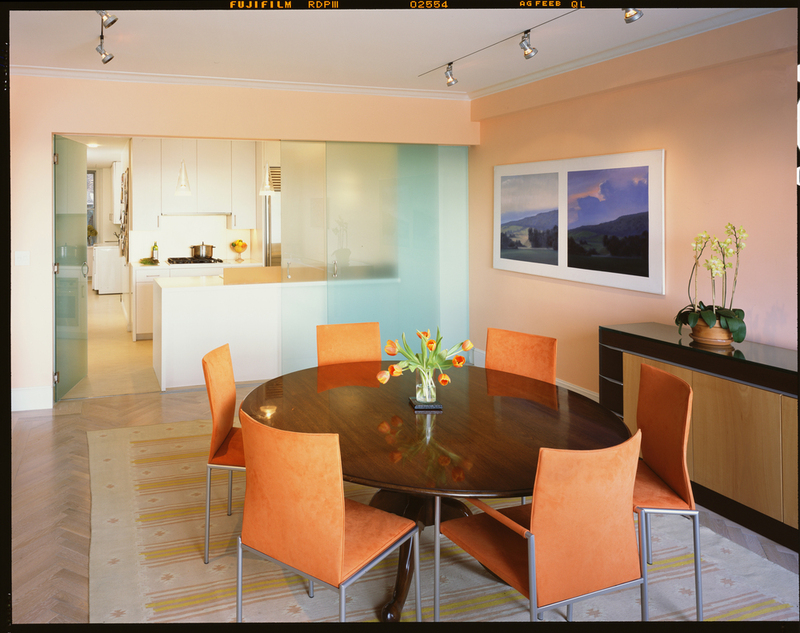 Color and light was of paramount importance to the clients. 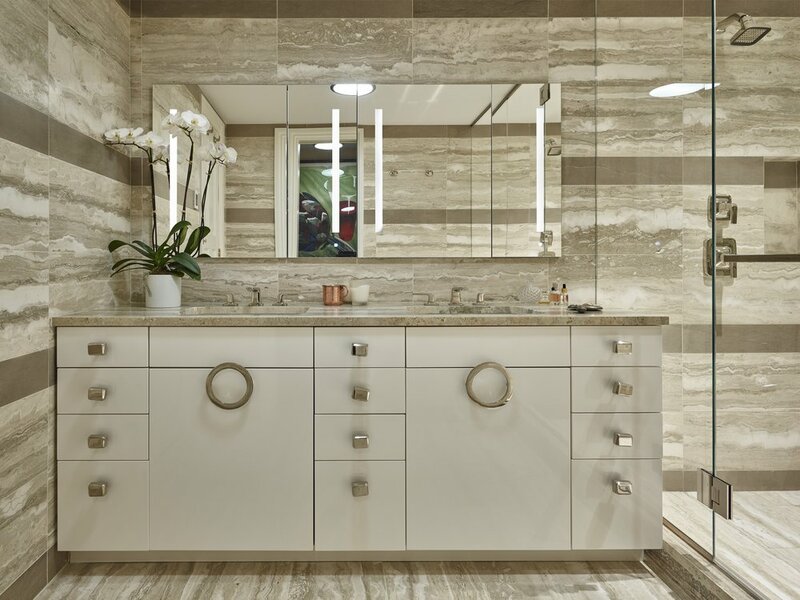 For the bathroom, ming green tumbled marble tiles, green glass tiles, seagrass Corian counter, acid etched sea foam glass wall, and eucalyptus-color resilient flooring combine harmoniously. In the kitchen, white laminate cabinetry, white Corian counters and copper frosted-glass back splashes, compliment the dining room walls, creating a clean, light environment. Oak floors were bleached and refinished to lighten the living room and dining room. Custom designed stainless handrails line the public rooms to allow the client to safely negotiate the entire length of the apartment. 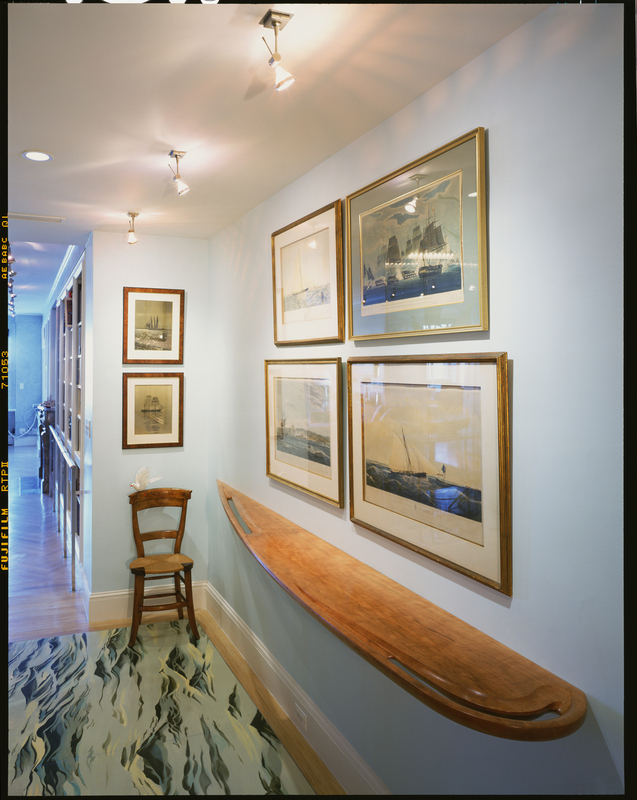 Artists were employed to create a trompe l'oeil ocean wave floor and custom etagere to mimic a boat's hull in the entry.